"The Lifeline AED is a semi-automatic defibrillator that is technologically advanced enough to include all mission critical features necessary to provide the most advanced treatment for Sudden Cardiac Arrest. Yet is so simple and unintimidating to use that even non-medical personnel can effectively save lives. The Lifeline AED has a simple two button user interface, clear, calm voice prompts, brightly lit progress lights and actively illuminated status indicator. 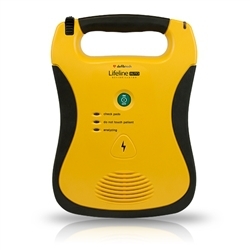 The Lifeline AED has a roomy handle and rubberized surfaces." "The Lifeline AUTO is a fully automatic defibrillator designed to analyze heart rhythm and automatically deliver a shock – without intervention – if needed." 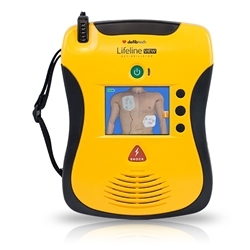 "The Lifeline VIEW AED is the first and only AED with a full-color interactive display that shows step-by-step videos for performing CPR, rescue breathing and external defibrillation. 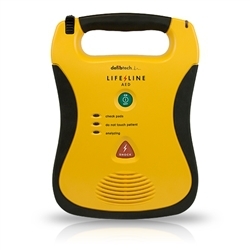 The Lifeline VIEW AED also has clear, calm voice prompts as well as on-screen text prompts, effectively providing three modes of instruction. The AED Status Screen displays essential status information and the Maintenance Mode permits the user to perform maintenance related actions as well as change unit parameters. The unit has a brightly lit status indicator and rubberized surfaces."